Each of Joel and Ethan Coen’s films feature some sort of religious icon. When I say “religious icon,” I mean an object that works as a doorway for entering the moral or sacred aspects of each story. In The Big Lebowski, it’s a rug; a rug that sends its owner (Jeff Bridges) on a not-so-epic journey of crime, passion, and bowling. In Inside Llewyn Davis, the icon is a runaway cat that manages to wander back home on its own, thus reminding the film’s protagonist of life’s stubborn circularity. The sacred image in A Serious Man is probably the easiest to spot. Protagonist Larry Gopnik just can’t get his television antenna to pick up the right channels—an illustration of the white noise he also receives from God. In the Coen brothers’ newest project, Netflix’s The Ballad of Buster Scruggs, the movie’s “icon” isn’t difficult to find either. It’s the film’s framing device—a book that also goes by the title The Ballad of Buster Scruggs. Each chapter in the book tells a different story set in the old American West, and bookends the movie’s six segments. 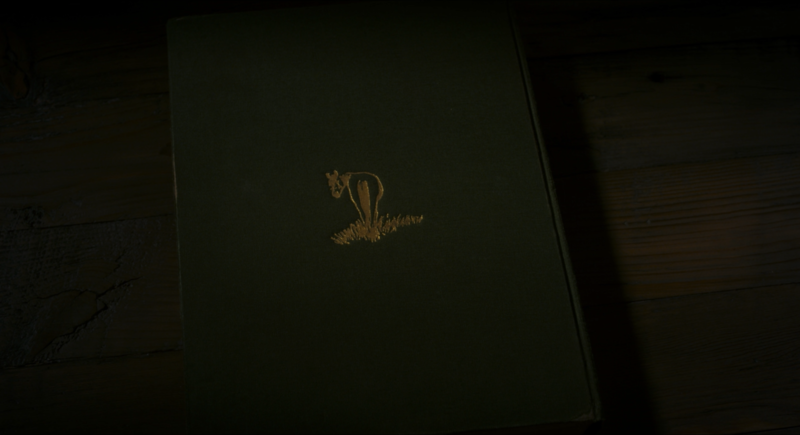 After the final chapter of the story, the book closes shut, revealing a donkey’s backside on the volume’s worn, green cover. The end. From the onset, the Coen brothers mark their concern for the Wild West canon—they’re people who know and respect the book. Buster Scruggs is a western about westerns (including our ideas about this time in U.S. history). And the Coens stick to the script, mostly. There are saloon shootouts and cowboys fighting Native Americans. Duels and exaggerated deaths. Everything you’d expect to find in an old paperback western or one of those classics from Hollywood’s Golden Age. By playing to tradition, while at once forging their own trail, the Coens manage to both nod to and question the orthodoxy of what we’ve been told about the grand ‘ole world of outlaws and guns and rickety wagons. But blink and you’ll miss the inversions of that script—the subtle shifts that question the underlying traditions that pioneered the genre. By playing to tradition, while at once forging their own trail, the Coens manage to both nod to and question the orthodoxy of what we’ve been told about the grand ‘ole world of outlaws and guns and rickety wagons. America’s frontier as depicted in popular culture only exists within the world of entertainment, but what might this entertainment be able to teach us? “The book” also illustrates the thematic string that runs through each of the film’s six segments: the inevitability of death. Just like the volume closes at the end of the picture, our stories will one day end, too. Good, bad, happy, sad; we’re all just buzzard food in waiting. 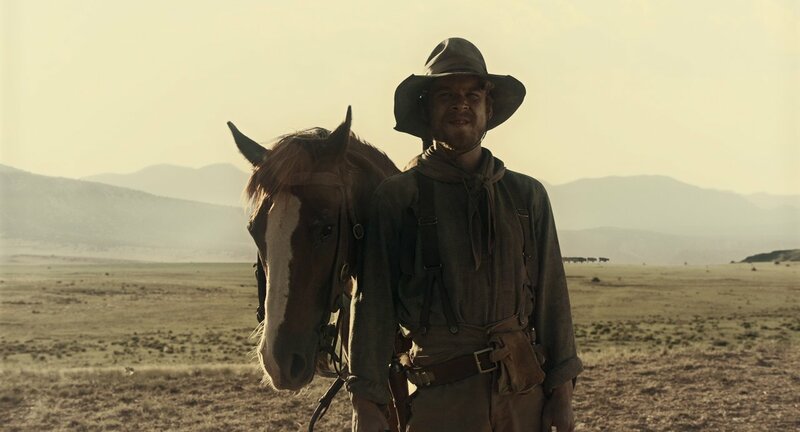 If there’s one lesson we can all learn from The Ballad of Buster Scruggs, it’s that we better be ready for the donkey’s backside. Yet, this frame alone feels a little thin for the anthology. A book also brings to mind a world outside of the stories therein. One even begins to wonder that perhaps, instead of a detached narrator—a cruel universe simply orating our destiny—these stories quietly consider the existence of a Writer. A Writer with a unifying plan even in the face of this dizzying universe. The Coens film their scenes in the style of the folk tales that inspired their project. The West is another world; it’s mythic and ghostly. One could even call it a staging ground. Is it hell or is it purgatory? 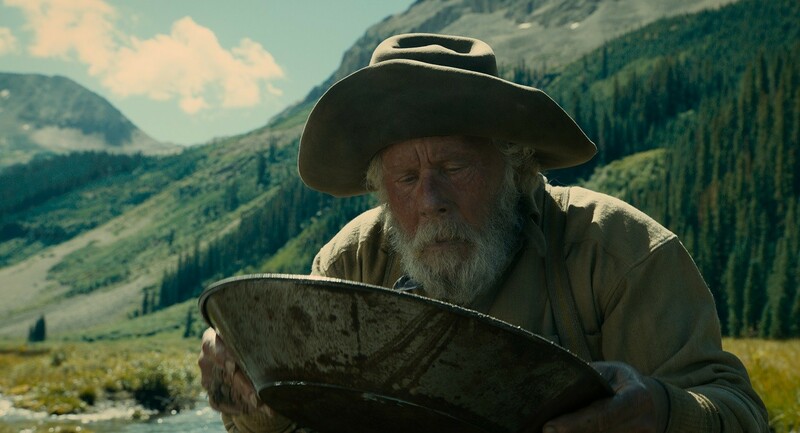 Below, the writers of Christ and Pop Culture dig deep into these considerations, examining in unique and different ways each of the segments from The Ballad of Buster Scruggs. While there’s no right reading of the film—the Coens don’t seem to want right, only good or excellent—each section wrestles with the spiritual implications tangled up and down each of the movie’s chapters. It’s from there, hopefully, readers will be able to zoom out on their own, and see the larger strokes that make up this mesmerizing work. 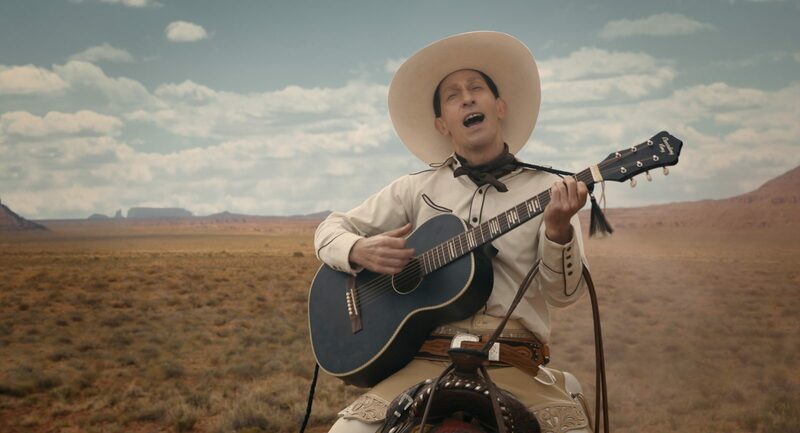 The film’s first vignette, “The Ballad of Buster Scruggs,” follows a singing buckaroo played by Tim Blake Nelson. Despite not looking much like the “cowboy type” (one could never get Nelson confused with Eastwood or Wayne), Scruggs certainly holds his own in a fight. A few minutes after his introduction, we watch as Scruggs easily disposes his enemies with the type of comedic-like violence one would find in a rated R version of Tom and Jerry or Looney Tunes. Eventually, the guitar-strumming gunslinger makes his way into a saloon where’s he’s asked to play another man’s poker hand. Scruggs picks up the cards to reveal a set of aces and eights. Known as “the dead man’s hand (legend holds that Wild Bill Hickok held similar pairs just before his murder), Scruggs declines to enter the game. This leads to a murder and two duels—the last of which ends Scruggs’s life. There’s just gotta be a place up ahead where men ain’t low-down and poker’s played fair. If there weren’t, what are all the songs about? I’ll see y’all there, and we can sing together and shake our heads over all the meanness in the used-to-be. Here, Scruggs longs for a place where humanity is good (“men ain’t low-down”) and death is no more (“poker’s played fair”). Could such a haven actually exist, despite the evil he’s experienced in the rugged frontier? Scruggs certainly sees music and folk stories as a reflection of this longing (“If there weren’t, what are all the songs about?”). If death is inevitable—we’ll all get “the dead man’s hand” at some time or another—then maybe the afterlife is awaiting the end of our story, too. But with the Coens, certainty is never that simple. 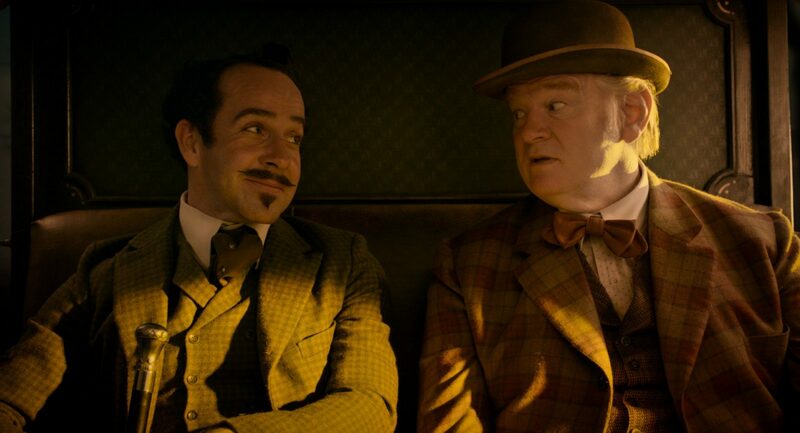 Though Scruggs wears a white hat (literally), and likes to think he only uses violence when provoked, he’s as much a villain in this film as those he kills. His corky demeanor and cheerful getup only serve to disguise his true outlaw nature. “The Ballad of Buster Scruggs” is his fantasy, told through his eyes. A fantasy that, in the end, forces viewers to wrestle with the effects of personal and national myth-making en masse. Might the violence and pursuit of self-autonomy found in the Wild West say more about our nation’s darkness than it says about our sense of cultivation, resourcefulness, and exploration? One thing’s for certain, Scruggs may long for heaven, but he fails to admit how he contributes to hell on earth. 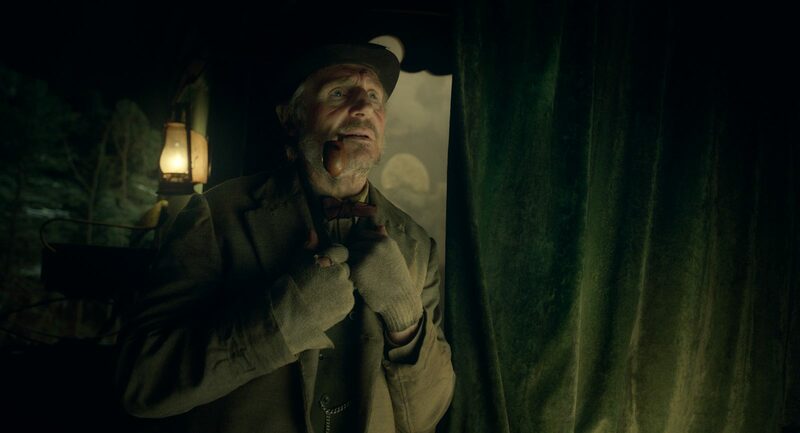 Death visits the righteous and unrighteous alike in all six of The Ballad of Buster Scruggs’s otherwise unrelated segments. Yet the film’s second chapter, “Near Algodones,” demonstrates more than any other the most fundamental (and inevitable) of biblical truths: the wages of sin is death. Clocking in just shy of 12 minutes, “Near Algodones” begins in the desolate plains of New Mexico. A bank-robbing cowboy (James Franco) pegs the First National Bank & Trust of Tucumcari as easy pickings for a quick pay day. But his plans are all for naught when the bank’s bumbling teller (hilariously portrayed by Stephen Root) proves himself no stranger to intimidation, easily outwitting and outgunning the would-be criminal. Moments later, neck in the noose and hands roped behind his back, the cowboy awakens from the encounter, tried and sentenced to the only punishment suitable for an attempted bank heist in the Old West: death by hanging. Then, only seconds away from meeting his Maker, the cosmos grants our antihero a second chance. A Comanche tribe suddenly attacks and slaughters the entire hanging party in a scene of bloody Coen Brothers mayhem. The cowboy miraculously escapes his Judgment Day. Still, justice denied is only justice delayed, and in the moral arc of “Near Algodones,” death will catch up to us all. Franco’s cowboy is mistakenly pinned for another crime altogether, one he didn’t actually commit—one which exacts the same heavy price of death. Here, there is no rest for the wicked, no sunset into which he may ride, only a hangman’s gallows from which to swing. The wages of sin is death, after all, and nobody leaves Algodones, New Mexico, without paying up. The Wild West was made possible by the entrepreneurial spirit, with Americans traveling westward in search of gold, land, or business opportunities. On the frontier, the rules were still being written, and an enterprising person could find ways to turn those rules to his advantage, or at least turn a profit off the people who were doing so. “Go west, young man, and grow up with the country” went the saying, a lofty bit of rhetoric to elevate the prosaic ambition of ascent via bootstrap. Both lofty rhetoric and pecuniary concerns feature prominently in “Meal Ticket,” which centers on a grizzled Impresario (Liam Neeson) whose traveling show consists of a single man (identified in the credits only as “Artist” and played by Harry Melling) giving literary recitations alone onstage. The most striking aspect of the show is the Artist’s appearance: he has no arms or legs and delivers the entirety of his act while harnessed to a chair for balance. The Artist’s physical limitations are a sharp counterpoint to the grandeur of the words he recites, night after night, for crowds of pioneers. The audiences for whom he performs may see him only as a diversion or a gawk-worthy sideshow, but the Artist hardly cares; his soul seems to take flight with the recitation even if his limbless body is tied to a piece of furniture. Unfortunately, the Impresario cares less about elevated souls and more about coins clinking in his hat, which is bad news for the Artist when the paying audiences start to dwindle. The Coens’ resolution to this tension, which involves a trained chicken and some cold business calculation, fits right in with many other movies in their filmography, in which people do horrible things to one another just to make a buck. Welcome to the land of opportunity. The sun rises over the mountains as beams of sunlight stream across a wide meadow: a swath of green, a valley bisected by a clear mountain stream. Tiny fish dart in and out the current, a cloud of insects hovers over the water. A great-horned owl beats her wings against the blue sky, making her way to the upper branches of a ponderosa pine. An elk comes to the stream, dipping his head to drink from the waters. He saw no sign of man nor the handiwork of man. The sound of a human voice cuts across the valley, descending down the mountainside. The elk turns tail and bounds away, the insects scatter, the tiny fish dart out of sight, the owl swells her feathers before taking flight. The voice is old, it is a rusty hinge of a voice, belting a sentimental ballad from a used-up country, far away from this place. The voice belongs to an old man (Tom Waits), who clambers, pigeon-toed, into the valley to see what is what. He leads a donkey named Lucky, and he is looking for gold. The prospector stops at the stream to drink. His throat shudders, tasting the water for riches. He knows it is here, the same way the elk knows to come to the stream for water. The old prospector digs into the mountainside and pans the soil; he employs a methodical approach in his search for the pocket of gold. He finds tiny nuggets, bits that have made their way into the stream from the mountain. The gold rocks catch the sunlight, glinting against the dull gray river pebbles—currency everywhere but here. The prospector searches for the pocket of gold, digging into the mountain until he finds it. Mr Pocket! he calls out. I may be old. But you are older. The prospector digs until the valley is scarred with holes, until he finds Mr. Pocket—and until another prospector finds him. The first prospector takes just enough gold for Lucky to carry, leaving the owl to her eggs, the fish to the water, and leaving the second prospector behind to his share of the rewards. The prospector says good-bye to Mr. Pocket, who is older, much older than he is. He sings his used-up Irish ballad as he leads Lucky along the stream and out of the valley. The elk returns to the water, stopping to sniff at the bit of overturned earth—the only sign of the handiwork of man. A certain kind of man started westward, blazing a trail for the endless stream of settlers who followed. Mr. Arthur is that man. In his many years of leading wagon trains—along with his associate Billy Knapp—along the Oregon Trail, Mr. Arthur found it best to store up all his words and minimize his movement until such time as he had a need of both. Billy Knapp is the more forthcoming of the two, and it is Billy Knapp who becomes the advisor to Alice Longabow (Zoe Kazan), the young woman who, along with her brother Gilbert and his yapping terrier, has joined the wagon train. When tragedy befalls her brother, Alice—until now a frightened and nervous young woman—suddenly must determine the fate of her household, including that of Gilbert’s yapping dog. To continue to Oregon or turn back? Alice decides to continue. Billy is loquacious in his attempt to help Alice, going so far as to ask for her hand in marriage. Alice ponders and consents. “You,” she tells Billy, “are so easy to talk to.” Billy tells Mr. Arthur that he is marrying Alice and settling in Oregon, leaving the trail for good, and Mr. Arthur does not say a word in response. But when Alice wanders away from the wagon train and onto the prairie, it is Mr. Arthur who finds her. The two of them are alone, and Mr. Arthur realizes they are easy pickings for a war party. He sees the signs and springs into action, narrating what is happening and what is to come; an attack is imminent. Words—not a single one wasted—tumble out of his mouth as he gives Alice a gun with two bullets and explicit instructions about what to do if faced with the inevitability of capture. Death—always in the wings, just off-stage—has made an appearance and must be fended off, all faculties employed. “We ain’t licked yet,” Mr. Arthur says to Alice. “But if we are, you’ll know what to do.” Alice knows what to do, and, before it is all over, she does it. She has been making decisions left and right, ever since she headed west. In the heat of the moment, as the eloquent and vigorous Mr. Arthur fought off the Indians, Alice may even have recalled the last conversation she had with Billy Knapp. “Uncertainty is appropriate for matters of this world,” Billy had said to Alice. “Only regarding the next are we vouchsafed certainty.” When Billy said this, only the night before, Alice, her eyes shining, had answered, “Yes.” She was in full agreement. 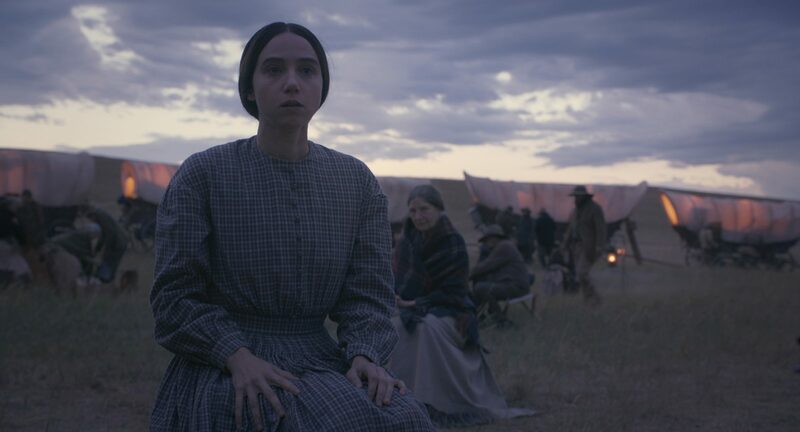 “The Mortal Remains” serves as a fitting bookend to a film that began with the story of Buster Scruggs. Both segments feature characters who are implacable avatars of death: the cheerful Scruggs in the first segment and the two bounty hunters (evocatively calling themselves “reapers”) in the last. Where “The Ballad of Buster Scruggs” ends with the spirit of the titular character ascending into heaven, borne aloft by angelic wings and sweet melody, “The Mortal Remains” closes with an image of two men lugging the titular corpse up a tall flight of stairs, the top of which is just out of sight. Together, the two stories (and the film as a whole) pose some thorny questions: How do we make sense of our occasionally capricious fates? What will happen when the final bill for our lives comes due? The Coen brothers don’t suggest any answers. They prefer to let the questions linger somewhere between the movie screen and the audience. The obliqueness of their approach and the power of their filmmaking tease you in the same way that movement detected by your peripheral vision seems to cease as soon as you turn your head. In “The Mortal Remains,” three passengers ride in a coach with the “reapers,” and each passenger has his or her own petty preoccupations. But one thing is true for all of them: death, in the form of a slain outlaw strapped to the top of the carriage, travels with them. It hovers just above their heads. As the sun sets and the neatly trimmed goatee of one bounty hunter (Jonjo O’Neill) takes on a Luciferian aspect, the passengers are impelled toward a reckoning of some sort. And we, the audience, are along for the ride. Listen to Seeing and Believing’s review of The Ballad of Buster Scruggs.